Joao Talocha prefers to play with his left foot, as do 16% of his teammates. The 29-year-old Joao Talocha was born on August 30, 1989 and is therefore one year older than his team's average age. 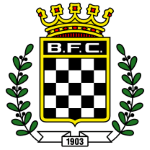 At present, Boavista FC is in Primeira Liga (Portugal) they are in 14th place. He had 27 match appearances this season. The Portuguese defender Joao Talocha joined his current team, Boavista FC (Portugal), in July 2016. Standing 1.8 meter high, he is tinier, when looking at the average height in his team. So far this season, he lost 50% of Boavista FC's matches in Primeira Liga. Unfortunately they lost the entire set of their latest fixtures. Two years and 11 months was the maximum period Joao Talocha ever played in a team, which is FC Vizela (Portugal). It's been 13 days since he played his latest match. Boavista FC's number 5 is Joao Talocha. Weighing 165.35lb, he measures 3lb less than the average player on Boavista FC. The briefest time his spent on a team counts 34 months in his present club. Boavista FC has seven more defenders in their squad, namely Neris, Edu Machado, Raphael Silva, Jubal, Stephane Sparagna, Carraca and Goncalo Cardoso. Joao Talocha played for FC Vizela before ending up in Boavista FC. In his footballer career, a total of 15 cards were ascribed to Joao Talocha. While thus obtaining an average of 3.75 cards per term, he has not even gotten any yet, for now. This season he scored two and assisted no goals which is 9.1% of all of Boavista FC's goals in Primeira Liga 18/19 (Portugal). On average, he hit the net 0.07 times per match this season which is a better performance than last year's. Back then 0.03 goals and 0.03 assists per match have been achieved.